Kagyé (Tib. བཀའ་བརྒྱད་, Wyl. bka' brgyad) or Drubpa Kagyé (Skt. aṣṭamahāsādhana; Wyl. sgrub pa bka' brgyad; Eng. 'the Eight Great Sadhana Teachings') — the term Kagyé refers to the eight (Tib. gyé) sets of Mahayoga teachings or transmissions (Tib. 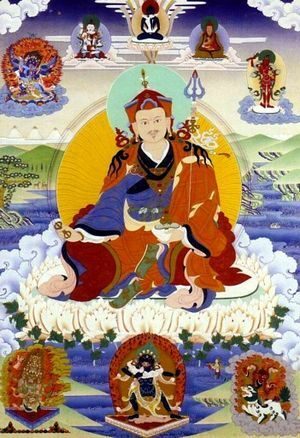 ka) entrusted to Padmasambhava and to the eight vidyadharas of India. Among the eight principal deities of the Kagyé mandala, there are five wisdom deities who represent the enlightened body (Tib. ku), speech (Tib. sung), mind (Tib. tuk), qualities (Tib. yönten) and activity (Tib. trinlé) of all the buddhas and three semi-worldly or worldly deities. The deity representing the enlightened body is known as Mañjushri Body or Yamantaka. Although usually Mañjushri represents enlightened speech, here in the Kagyé he represents enlightened body. 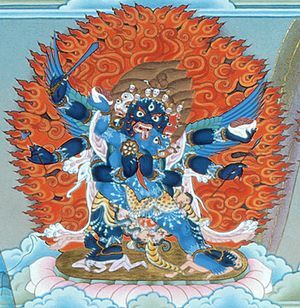 Having the nature of Mañjushri this deity appears in wrathful form and is known as Yamantaka. This is the same as the yidam deity known as Vajrabhairava (Tib. Jikché), on which the followers of the Riwo Ganden tradition (i.e. the Gelugpas) meditate. Hayagriva is a wrathful manifestation of Avalokiteshvara. Generally, Avalokiteshvara embodies the compassion of all the buddhas, and so he is connected with the enlightened mind, but in his manifestation as Hayagriva he represents enlightened speech. Vajrasattva is the peaceful form. The wrathful manifestation of Vajrasattva is Yangdak Heruka. He is similar to the deity known as Chakrasamvara (Tib. Demchok), who is practised in the Gelug tradition, and all the deities of the Mother Tantras are included in the practice of Yangdak. Generally, Chemchok is the chief of the mandala, but here in the Kagyé, Chemchok is the deity who embodies all the buddhas’ enlightened qualities. The deity representing enlightened activity is Vajrakilaya. In peaceful form, he is Vajrasattva, in semi-wrathful form he is Vajravidarana (Tib. 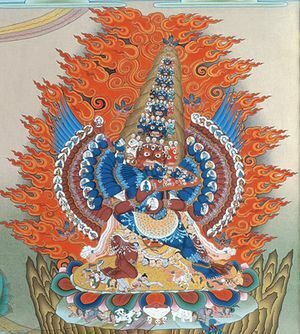 Dorje Namjom), in wrathful form he is Vajrapani, and in extremely wrathful form he is Vajrakilaya. These five are wisdom deities. Mamo Bötong is a deity who is in-between (literally ‘on the border’) the wisdom and the worldly deities and neither male nor female. Jikten Chötö and Möpa Drakngak are worldly deities. They are both the manifestation of Vajrapani, but they appear in the form of worldly deities. Within the general Kagyé cycle, the central deity is Chemchok Heruka. He appears in the centre of the mandala, while the other Kagyé deities appear in the four cardinal and four intermediate directions. Chemchok Heruka has twenty-one heads and forty-two hands. The two principal hands hold Samantabhadra and Samantabhadri. His twenty hands on the right side hold the five buddhas of the five families, the eight bodhisattvas, the four male gatekeepers as well as three of the six munis – those who emanate in the three higher realms. And the twenty left hands hold the five buddha consorts, the eight female bodhisattvas, the four female gatekeepers and the three munis who emanate in the three lower realms. The deities in the right hands are all male and the deities in the left hands, with the exception of the three munis, are all female. These forty-two deities are the peaceful deities of the mandala of the hundred peaceful and wrathful deities. The consort of Chemchok is Namshyalma (Wyl. gnam zhal ma). She has nine heads and eighteen hands. Her main central hands hold a vajra and skull-cup (Skt. kapala). The eight hands on her right hold the wrathful manifestations of the eight bodhisattvas, known as the eight gaurima and then the eight on the left hold the wrathful emanations of the eight female bodhisattvas known as the eight singhama. Chemchok, the deity embodying enlightened qualities is an emanation of Samantabhadra, and is therefore the chief of the mandala and appears in the centre. Lama Rigdzin therefore takes the place of Chemchok in the south west, making nine main deities in total. There are 406 main deities and retinues. To these are added five sets of sixty messengers (ponya) representing body, speech, mind, qualities and qualities. This gives 706. With the twelve tenma of Tibet and the seven mothers there are 725 deities. Vajradharma, the 'keeper of secrets', compiled the Kagyé teachings and wrote them down. He then took them to the Shankarakuta (Tib. Deché Tsekpa) where they were buried in the presence of the great dakini Lekyi Wangmo. In the stupa together with the eight caskets, one for each of the Kagyé, there was one additional casket made from five different precious materials and studded with precious gems, within which were eight divisions corresponding to the eight Kagyé. Unlike the other teachings which were for the separate practice of each individual deity, these teachings were for the joint integrated practice of all eight simultaneously. This casket was put in the centre of the eight vajra masters, without being given to any one in particular. The teachings that came from this chest were the Kagyé Deshek Düpa: ‘The Gathering of the Sugatas of Kagyé’. When each one of the great vajra masters who had gathered at Deché Tsekpa—Humkara, Manjushrimitra, Nagarjuna, Padmasambhava, Dhanasamskrita, Vimalamitra, Rambuguhya and Shantigarbha—had received their particular chest, they opened them and extracted their respective teachings (see below). However none of them were able to open the final casket containing the eight sectioned Kagyé Deshek Düpa, so for seven days the vajra masters became absorbed together in meditative equipoise, and prayed single-pointedly to the dakinis to assist them. As a result, after the seven days had elapsed, the seal of the last casket sprang free and it opened of its own accord. This is how they were able to extract the teachings of Kagyé Deshek Düpa. Another historical account records how, since this receptacle could not be opened by the eight vajra masters, it was placed back inside the Deché Tsekpa stupa and buried once again. Then at a later date Guru Padmasambhava returned to open the seal and reveal it. When he extracted the Kagyé Deshek Düpa from the casket, the dakinis guarding the treasure asked Padmasambhava to practise these teachings and transmit them to others. According to yet another account, the Vajrakilaya teachings were brought out and passed by the dakinis into the hands of the vajra master Prabhahasti, who then later transmitted them to Guru Padmasambhava. However, the casket of five precious substances containing the Kagyé Deshek Düpa was given directly by the dakinis to the vajra guru Padmasambhava. It is said that unlike the other vidyadharas, who each received only one of the eight practices, Guru Rinpoche received a practice related to all eight Kagyé deities. In this practice Chemchok Heruka appears as the central deity surrounded by the other eight deities in the four cardinal directions and four intermediate directions. For example, Yangdak Heruka is in the east, Yamantaka in the south, Hayagriva in the west, and Vajrakilaya in the north. Lama Rigdzin, whose practice arose specifically for Guru Rinpoche, appears in the south-west, because the central place is taken by Chemchok Heruka. Not only did Guru Rinpoche receive this cycle of teachings focusing on all eight Kagyé deities, he also received empowerments, oral transmissions and instructions from each of the eight vidyadharas individually. 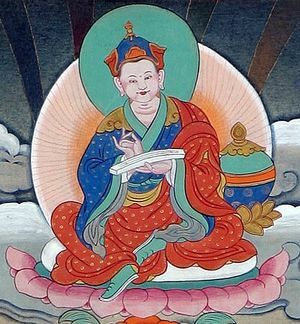 Within the context of Kyépa Mahayoga, Guru Rinpoche taught the eight great sadhana teachings (Wyl. sgrub pa bka' brgyad), or Kagyé. These teachings were divided into general and particular. 'General' refers to the Kagyé as a whole, and 'particular' refers to each cycle of the Kagyé deities individually. One cycle is related to Yamantaka, another related to Hayagriva, and so on. The general cycle was entrusted to King Trisong Detsen after Guru Rinpoche had given him the empowerment at the Samye Chimpu caves. These teachings were later revealed as termas by three of Trisong Detsen's own incarnations: Nyang Ral Nyima Özer, Guru Chöwang and Rigdzin Gödem. They revealed termas known as the three Kagyé collections (Tib. Kagyé Nam Sum), which are ultimately based on the general Kagyé teachings that King Trisong Detsen received from Guru Rinpoche. Nyang Ral Nyima Özer revealed what is known as Kagyé Deshek Düpa, Guru Chöwang revealed the Kagyé Sangwa Yongdzok and Rigdzin Gödem revealed the Kagyé Rangshar. Apart from King Trisong Detsen, Guru Rinpoche also transmitted the Kagyé teachings and empowerments to all of his twenty-five disciples. Among these, eight showed particular signs of accomplishment in the practice related to one of the Kagyé deities, after their flower had fallen on the corresponding deity in the mandala during the empowerment. 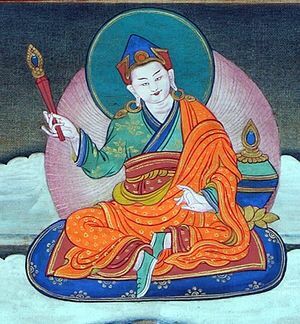 Guru Rinpoche gave prophecy and entrusted each one with the complete tantra and sadhana for the cylces they had a connection with. According to the Five Chronicles they are as follows. Chögyam Trungpa, The Lion’s Roar: An Introduction to Tantra, Collected Works, Volume Four (Boston & London: Shambhala, 1993), Part Two, Chapter 9, ‘Mahamudra And Maha Ati’, pages 306-319. This page was last edited on 31 October 2018, at 04:18.